Note: Pivotal deprecated V3 of their API on January 22, 2019, rendering a previous target option of the setup non-functional. If you use the Pivotal Tracker integration, you can have comments on your tickets when you make changes in Pivotal Tracker (these comments are private). Create a project in Pivotal Tracker, or, if you already have one, open that project. Go to Project > Edit Project Settings . Once you do you'll see a navigation bar along the top. Click on the button for "Integrations". Scroll to the bottom of the new page and look for the section titled External Tool Integrations . You'll see a drop-down menu that says Create New Integration . Click it and scroll down to Zendesk. Name your integration. The default name should be fine. Provide the address for your installation. Make sure you type in the URL including a trailing "/" at the end. For example, if my Zendesk was located at example.zendesk.com I would enter: https://example.zendesk.com/ in this field. Now you will need to pick an account that Pivotal Tracker will use to connect. You can use a dedicated account or just pick somebody else's account. Enter their username (email address) and password. When Pivotal Tracker talks to Zendesk Support, it will pull a list a tickets from a view within Zendesk Support. You can either create a new view, that only shows tickets with the tag "Pivotal" on it (for example) or just use a default view (like "All Unsolved Tickets"). In a new browser window, open the view. At the very end of the URL you will see a number. This is the view ID. Copy it over to Pivotal Tracker. Head back to the main page of your Pivotal Tracker project. 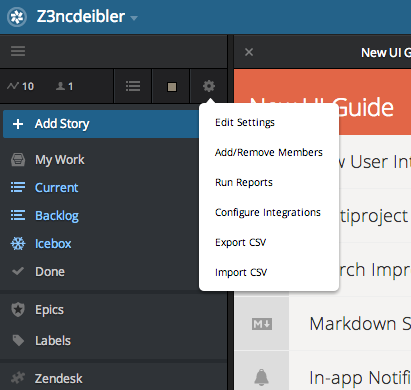 Hover over the More menu and go to the link that says "Zendesk". A new pane should now load, labeled Zendesk, and will contain all the tickets in the view that you had in your view. Hi, I created the integration between the Zendesk and Pivotal Tracker using the first method. According to the instructions, I need to create a trigger that then pushes tickets to your Pivotal Tracker project. I would like step by step instructions on how to do this because it's I don't know how to set up a trigger to do this. Can you please provide those instructions? Welcome to the Community, Karen! We actually have some instructions on how to do this in our article on external targets. You can find that over here: Using targets in automations and triggers. That should give you the information you need! We use office 365 to authenticate to zendesk. I tried the second method, "
Creating a Zendesk Support integration in Pivotal Tracker"
When I try to put in my office 365 login in, it says " The Zendesk server reported an authorization failure while accessing your account. Please check your Zendesk URL, your Zendesk User Email, your Zendesk User Password, and your View ID." I am sorry this is happening to you, unfortunately we would need more details about this issue and therefore, since it is going to be a more account specific question, we would need to create a ticket so we can process with the troubleshooting from there on. I am sorry I am not able to be of more help here but I can meet you on the ticket later. We just started using Pivotal Tracker to keep track of bugs and features that we hear from our users. Currently we paste in the Zendesk ticket link so we can go back and update afterwards when it is delivered. By using the second method described here, are we able to somehow link these tickets in Pivotal Tracker so when a comment or a story is updated it will leave a comment and set the status to Open on the Zendesk ticket as well so our support team can see this? Or does it just create a new ticket in Zendesk with the updates? Anybody have success with setting Zendesk tags > Pivotal Labels? We'd like to tag a ticket in Zendesk and then have that show up as a corresponding label in Pivotal through the integration. Doesn't look like that's an option in the current settings. How can we add that? Any ideas? There was a problem retrieving data from this integration. The Zendesk server reported an authorization failure while accessing your account. Please check your Zendesk URL, your Zendesk User Email, your Zendesk User Password, and your View ID. On Zendesk side we are using SSO so we don't provide a password specifically for Zendesk. In the integration definition in Pivotal, providing the password doesn't seems to let us access Zendesk remotely. We suspect SSO is preventing us to connect through the integration. I created a Pivotal Target following the instructions on here, but when I click Test, nothing happens. I also don't see any sort of error message to clue me in on how I might have misconfigured the target. I set up a Pivotal / Zendesk integration and everything was working fine for a while. Now, the new Stories are no longer being pushed to Pivotal. The trigger conditions are being met, and the Extension is being kicked off, but no new stories in Pivotal. Just like Jack reports above, the "Test Target" is not pushing a story to Pivotal, either. -We did not change any settings in the integration when this broke; have now recreated the integration again from scratch. -I can see the feed of Zendesk tickets (from a specific view ID) that are configured to be displayed in Pivotal. -It's just that push of a new Story that is missing. We use this feature a lot, any insight to what has changed with the application / integration would be much appreciated here! Yep. Something broke on our Zendesk/Pivotal integration yesterday too. "Test Target" does nothing, no new tickets created, no errors, nothing. According to https://status.pivotaltracker.com Pivotal Labs removed access to API v3 and v4 on Jan 22. Coincidence? Perhaps the Zendesk integration used some V3/V4 stuff? If that's the case we might be stuck waiting for them to fix it. @pivotal or @zendesk - little help here? Jon is correct. This appears to be an issue with the integration being dependent on the v3 API. I'm working on determining whether there is a fix in the works, and will keep you updated as I get more information. "In July of 2017 we announced our API V3 and V4 were being deprecated, with a scheduled removal date of December 31, 2017. At that time we encouraged folks to migrate any integration's using those versions over to API V5. However, because certain companies were relying on custom integration's that used these versions, and needed more time, we pushed the removal date back several times. We've since, as of January 22nd, finally disabled these versions completely. All that said, unfortunately it appears that the integration you described is using one of the deprecated API versions. We'd recommend reaching out to Zendesk support to see if they've perhaps built a different solution using our API V5 that can help. Otherwise, I'm sorry to say that any third party integration's using the old API versions will no longer work." That being said, the article on the Pivotal integration says "There are two ways to integrate with Pivotal Tracker. You can push tickets to Pivotal Tracker, using a target in Zendesk Support OR you can set up an integration to Zendesk Support from Pivotal Tracker." Some users have reported that switching from using the target to doing the direct integration fixes the problem. It sounds like the best bet at this point is to make that switch if you can. If anyone does and gets things working, do let us know! Thanks so much for the update Nicole. We already have the Integration to Zendesk Support from Pivotal Tracker setup, it was how we pushed comments and ticket updates from Pivotal tracker to Zendesk tickets. That integration is still working as expected. However, we're not clear on how to use our existing triggers and automations that were part of the Zendesk Extension that pushed content from Zendesk to Pivotal. It seems that now the system is just a one-way integration, unless we're missing something with the way the Pivotal integration should work. Are there any plans on the Zendesk side to fix this integration? Upgrade the system to Pivotal API V5? At the moment, I don't know of any plans for further development from our side. However, I did flag this issue for the team that manages our owned apps and integrations. As far as advising on how to use it, I'm going to have to leave those answers to other users who have done so. We do not use this integration at Zendesk, so I can't speak directly to that usage. The integration to Zendesk Support from Pivotal Tracker was the first thing I tried to configure and I'm honestly not sure how it's in any way useful. All it does is show a list of tickets and provide a link to them. All the tickets just appear in one big block and there's no easy way to create stories out of them." Jack-- I spoke with Pivotal Support today and they showed me a really cool feature I didn't know existed. Head to that list of Zendesk tickets you see in Pivotal. You can click and drag one of the tickets into either the Icebox or the Backlog, and it will convert it into a Story, and establish the same link the (now-deprecated) Zendesk integration did. This is really handy! I was able to get it all working using the 2nd method Nicole pointed out above, and the suggestion from Steven about moving tickets over was super helpful. Hope everyone else can get it working for them too! Great to hear that you got things working, Jon! Steven, thanks for sharing that detail. Working... kinda.. I spoke to soon. Sadly from our testing this morning we've discovered that it's FAR less capable than the Zendesk Integration. There are no comments from Zendesk tickets that show up when you pull the tickets over with the Pivotal Integration. I hope that Zendesk decides to upgrade their Integration to the newest Pivotal API so we can use the Zendesk Integration again. Ah, I'm sorry to hear that, Jon. I'll be sure to share this conversation thread with our developers. I'm wating for this fix too! Like Jon said, the pivotal integration with Zendesk is FAR FAR less capable! We're pretty dependent on this feature / integration. Please let us know when it's resolved. Thanks! Pivotal integration with Zendesk is Far less capable. I can't decide what fields get pulled over into a Pivotal tracker story, only the description does. We are very dependent on this integration, and it was one of the main reasons my team chose to go with Zendesk as a solution. There is currently a problem ticket open about this internally, but the team has not yet determined whether we will be upgrading to v5. I've created an incident ticket that I've connected to that PT with your comments, and we'll keep this thread updated when we hear something. A happy update for everyone - I received word today that the integration has been updated to V5 and should be working again! Please let us know if you have any issues. This is excellent news @Nicole! I guess the upgrade was pretty easy eh? I will test this out today and report back here if there's any lingering issues. Tell the team thanks from us! I'm not on the engineering team, so I can't speak to the level of difficulty involved. But I do know that we heard from enough customers - both here and in tickets - that they were able to expedite things and prioritize that update. So thank you all for sharing your needs!